Den-Con CL Casing Slips are designed to handle casing sizes from 6 5/8” to 48”. The multi-segment design provides even load distribution and full wrap-around gripping on all casing sizes. The CL Series Casing Slip is 4 taper and is rated at 500 ton. All CL slip parts interchange with Varco CMS-XL Casing slip parts. All CL slips are available with inserts or circular buttons. Steel handles are special order only. *Add "B" to assembly part number for buttons. “F” will be added to final slip part number indicating it is complete with Flex Handles. 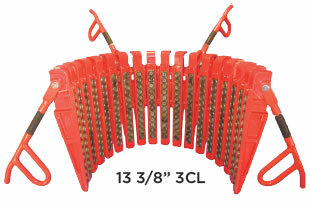 Den-Con 3CL Casing Slips are designed to handle casing sizes from 9 5/8” to 36”. The multi-segment design provides even load distribution and full wraparound gripping on all casing sizes. The 3CL Series Casing Slip is 3 taper and is rated at 200 ton. All slips are standard with flex handles. Steel handles by special order only. "F" will be added to final slip part number indicating it is complete with Flex Handles. Contact the company for sizes not shown. *Notes: All sizes furnished with 4 handles. 3CL Slips have 3 Taper on DIA and fit Den-Con 200 Ton Casing Spiders and the old style 3 Taper BAASH-Ross Casing Tools. Part # Wt. lb. Qty. Part # Wt. oz.